259 Sunday February 17th 1889 I was busy about the work all the forenoon and read in the afternoon while Will was gone to town. We got supper over early and read all the evening. There was none of the folks over today Monday February 18th 1889 I was busy about the work all the forenoon and Adda done some washing. Mother was over all the afternoon. I knit while she was here. I played on the piano some in the evening. 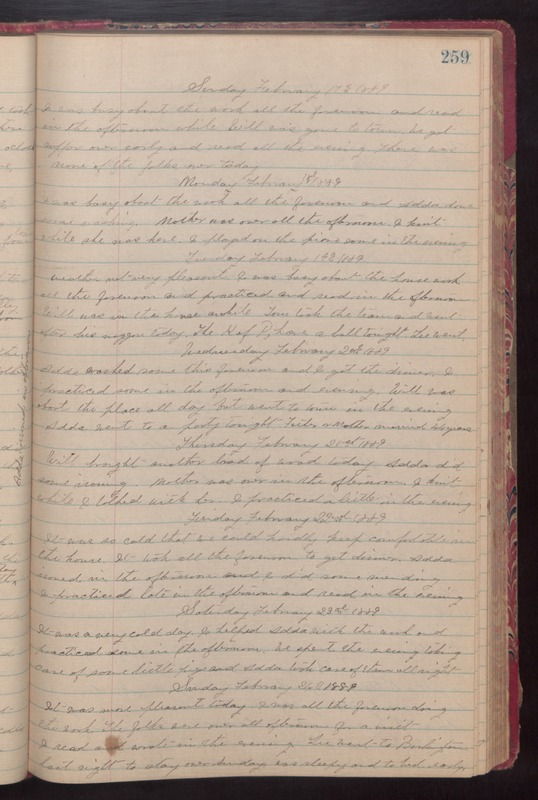 Tuesday February 19th 1889 Weather not very pleasant. I was busy about the house work all the forenoon and practiced and read in the afternoon Will was in the house awhile. Tom took the team and went after his waggon today. The K of P. have a ball tonight. Lee went. Wednesday February 20th 1889 Adda washed some this forenoon and I got the dinner. I practiced some in the afternoon and evening. Will was about the place all day but went to town in the evening Adda went to a party tonight. Father & Mother married 44 years. Thursday February 21st 1889 Will brought another load of wood today. Adda did some ironing. Mother was over in the afternoon. I knit while I talked with her. I practiced a little in the evening. Friday February 22nd 1889 It was so cold that we could hardly keep comfortable in the house. It took all the forenoon to get dinner. Adda ironed in the afternoon and I did some mending. I practiced late in the afternoon and read in the evening Saturday February 23rd 1887 It was a very cold day. I helped Adda with the work and practiced some in the afternoon. We spent the evening taking care of some little pigs and Adda took care of them all night Sunday February 24th 1889 It was more pleasant today. I was all the forenoon doing the work. The folks were over all afternoon for a visit I read and wrote in the evening. Lee went to Burlington last night to stay over Sunday, was sleepy and to bed early.